Burning Man has always made me dreamy from beautiful pictures to the famous Malcom in the Middle episode. I’ve always wondered what was behind the mystery and how people were living the experience. Remi Jaouen, 29, is a professional photographer from France I met while I was in Paris and part of the photography club. After studying engineering in Brest, Bretagne he started photographing around 23 as a trigger to a new addiction. Now as his full-time job, he never stays in the same place. Between Paris and Bretagne, Weddings in the french Summer and long adventures around the globe, he chose this year to discover the mysterious Burning Man Festival in the United States. He told me his crazy adventure as well as discovering Paris cities, made in USA. Where did you go for your last adventure in the U.S? I arrived in San Francisco, where I spent two days to visit before meeting Eric Bouvet (Professional and Praised photographer with many publications such as Time, Life, Newsweek, Paris-Match, Stern, NYT magazine and The Sunday Times Magazine) and Olivier O’Mahony (US Bureau Chief for French Magazine Paris Match) who took me into their camper to Burning Man. They came for written and photography piece for Paris Match. It's been a great help in my organization. We therefore went to the Nevada desert crossing Sacramento. After the Burning Man, we got back to San Francisco. From there I found a car to get from Seattle to New York which matched the journey I wanted to do. I only had to pay gasoline. I stayed a few days to rest in Tacoma in Washington State with a friend, to recharge my batteries before the long journey. I then crossed many states where I discovered landscapes and met people. I was sleeping in typical motels at night, often in tiny towns with sometimes a bit dodgy and scary places. Very shabby and cliché of the American heartland. I crossed the states of Washington, Oregon, Idaho, Utah, Wyoming, Colorado and its magnificent mountains, New Mexico and Texas - where I stayed at a friend's who was a Burning Man airline pilot but he unfortunately had a tragic and very sudden accident soon after. So I then shortened the end of the journey and found some comfort at a very good uni friend working in Columbus, Indiana. I was late to give the car back and drove back in one go from his home to New York - 1200 km in the pouring rain and the night which was very difficult. The adventure does not always have good sides! "They say it's the third time you really understand the spirit, how it works to really enjoy your Burn." Why did you choose to attend Burning Man? How did you discover the festival? I first saw pictures in magazines and I liked the very photogenic look : People are dressed in brilliant way, vehicles are dressed up, Artwork is beautiful, always very surprising, inventive, ingenious and technical. I like places and communities where the "rules" of society, normality and how to behave with others is flattened and reconsidered. Burning Man is a place with its own rules, but implied that everyone applies them. They all go in the direction of compliance, it is the respect of the other or its environment. I can’t remember exactly what pictures I have seen first but I know I've seen a lot of Eric Bouvet, so it was fun to go there with him for my first time. I was really curious about it because lots of different things are said about Burning Man. I like to discover everything and now I know Burning Man spirit a lot more and also why people have so much difficulty to describe it. By the way, people say that it’s only at the third time one really understands how it works and its spirit to really enjoy the Burn! Can you describe the mood of Burning Man? I'm not sure that everyone would live well Burning Man. It is a unique experience and one does not agree to the spirit, I do not think one can appreciate it. Someone who believes it's a big party with psychedelic stuff, drugs and naked girls may be disappointed or feel out of it and surely will leave the second day! Burning Man is more a spirit and values, but in this context there is a very personal adventure. Nobody lives their burn the same way and everyone will describe their Burn differently. Can you describe why and what kind of person goes to Burning Man? It is a bit hard to describe the type of person going there. I think people are coming from very different horizons and of all age. 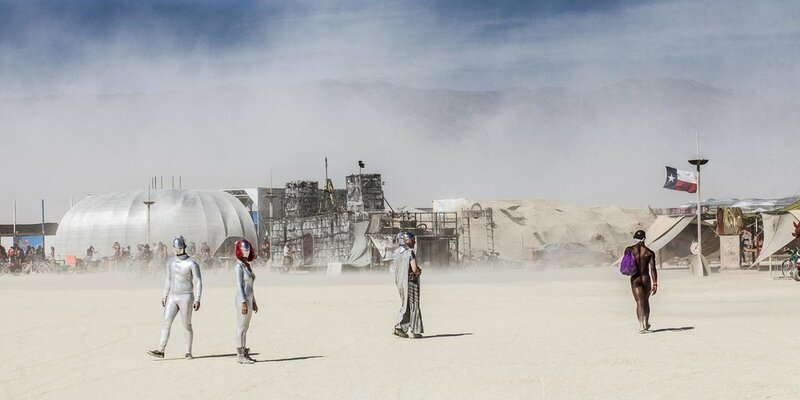 By the way, there are also children there which can surprise people not really aware of Burning Man. Black Rock City is a really smooth cocoon, everybody has good intentions so there’s nothing to be scared of really. If you lose or forget your professional camera, you will surely find it at lost & found objects (oops it happened to me.) So bringing children is really secure and they will even brag about it in school. People are really different but all look-alike on values and their motivations to go to Burning Man. Being open to other people, discover yourself, experimenting, respect of others, discovery of others… In short, the happiness of living together! Was it a lot of preparation or improvisation? The organization was rather preparing the budget. For Burning Man, we still have a minimum of equipment but it can be found in San Francisco anyway because space is limited in luggage. I like to improvise because it leaves a freedom and above that is the way that you meet people and you are doing things that no one would have expected. I work with very little equipment so the organization is easy enough to that level. I just needed something to print pictures and also store one month of photos with two hard drives that contain the same data to prevent loss of picture, shock or hard drive theft. "Burning Man is the proof people would be a lot more happy if they respected and were nice to each other." How then did you get the idea to visit American versions of Paris? Visiting New York or San Francisco, everyone does it, everyone dreams of it, and everyone knows it . I am often attracted in things nobody cares about. In a group, I prefer to talk with the discrete person who said nothing than one who speaks well and everyone listens to. One day I realized that there were many towns called Paris in the USA, so it was a fun excuse to see cities we would have no idea to visit otherwise. in my opinion, to know and understand a country you have to go anywhere. New York, for example, is a very large city that does not represent the United States - a country with many rural and sparsely populated areas compared to France. You can drive one hour without seeing a trace of human life. It was also a way to see their vision of France, and allusions to the capital. I thought it was also a good way to approach people by telling them "I'm from Paris too." But not the same Paris. What impression did you have of the different Paris you have visited? So I visited Paris, Idaho to beginning of the journey, it is the smallest with only 500 inhabitants where I only chatted with a waitress in the single restaurant in town. Then after my friend’s accident, I went to Paris, Texas. I photographed the Eiffel Tower and the memorial’s guardian just next door - who told me things about the city. In the evening, I went to a bar where I was alone with the barman. I told him my misadventures and him his. It is a moment that made me feel a lot better. I rapidly did Paris, Tennessee, who was also on my road but it was ugly and I did not find any point of interest. "I thought it was also a good way to approach people by telling them "I'm from Paris too." But not the same Paris." A highlight at Burning Man and / or on the way to Paris? At Burning Man, I photographed a paratrooper who gave me a ticket to board a plane and fly over to Black Rock City. I was so happy I told all my camp. Chris, a camp friend said he was a pilot for parachute jumpers. During my road trip in Texas, I did a pretty big detour to visit him at home, he lived around the parachute center and next to the dirt road among fields. I also jumped even though I was super scared. But I wanted to overcome my fear and I jumped, it was a great feeling! Full circle. In the evening we partied like crazy in Austin with other friends from Burning Man. It was great. I found his way of living simply as all instructors around the skydiving center very impressive, his job is to fly small airplane everyday. I thought he was not afraid to fly every day, he lived by taking risks but at least he lived his passion and thoroughly took advantage of life. I really made myself this reflection there thinking it a lot, telling me it was hard compromises of life in lots of areas, even in love, we enjoy life when we take risks. The more we take risks, the more advantage, but the greater the chance of losing life. He lost it the next day he would land. He took off for some reason and the plane picked the nose down suddenly and Chris died in the crash of his plane on the other side of the road. I had never really been confronted with death in my life and this was a very strange experience for me, especially in this part of happiness. It was a great story to the tragic end. Have you faced some difficulties during your journey? This story was a big difficulty. I assume we can be happy if we go to other easily. When we are too busy, it's hard to listen to others and be open-minded. Then just before I got another technical difficulty. I was at a gas station and my car was still at the gas pump while I filled my huge cup of coffee. Meanwhile a big pickup came crashing my Lexus and push my front wing. When you have problems in another country, you never really know how it is going to work. Eventually all the gas station came to support me and show they saw everything. The Subway lady even called the police to make an "accident report". Police came but ultimately it did not help. The guy ran away and despite that a customer had time to read three letters on the plate it was impossible to find and impossible to run his insurance. I lost my deposit for the car, 350 dollars, which was an expense that I had not anticipated. How have you approached your adventure photography-speaking? I always work in the same way in photography so I do not ask myself too many questions. I photograph the moments of joy, life innocuous scenes, precisely everything that is not particularly interesting but all those little moments that make life finally. I also like to see a general atmosphere of a place or event, so I take rather different picture for people to imagine the best the place where the event I want to tell. But I do it naturally without thinking about it. The only thing for which I have made an effort at the Burning Man and during the road trip is to do more portraits. Identify interesting people, have the courage to approach them and explain why they and not someone else then do fairly quickly a beautiful portrait with a natural context is not necessarily an easy exercise. I'm pretty happy with portraits I could make. Would you have advice for once on site, budget level, organisation, equipment? For the Burning Man, it's better to go with people who are already familiar with it. The organisation is quite complex because it is hard to imagine what we are going to need on site. It is best to find a camp and join. It will be a kind of family that will support you and direct you. For the budget you will find information on the internet with people who are travelers. It depends on your comfort, if you go in a camper that would not be the same budget than a tent. Frankly, a tent is already a big budget, and that's enough comfort as well. Just take a good air mattress, it lasts one week and you have to sleep well! I do not really know. I'm waiting to see what will happen to me, the meets that I do, the opportunities I have. I just recently met a Brazilian who I am very well getting along! I would go see, and I like to visit a country with people who live there, and I saw that country more like a local than a tourist. She lives in São Paulo, one of the largest cities in the world, and I like the big cities showing a lot about humans. They are to me great anthills where there is a great social and cultural diversity. They have their own codes. I know Paris well, obviously, as well as New York and I have a little experience in Mexico City that is in the top rankings. I like to compare things. In short, it would be a great adventure, although as always in life money is missing! But I will not complain, I just came back from a 2 month trip in the USA. Remi is now continuing his photography adventures in Paris. Head to his website to discover more of his work as well as his full photography report on Burning Man.